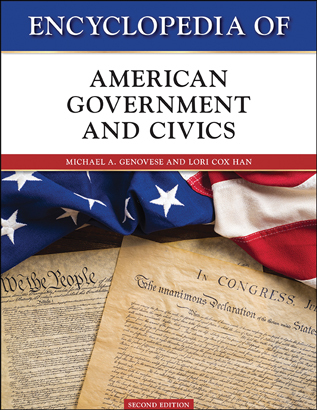 Designed to meet the needs of high school and college students as well as members of the general public seeking clear explanations of basic government and political topics, Encyclopedia of American Government and Civics, Second Edition is a comprehensive resource that is divided into nine sections containing hundreds of essay-length entries. Articles in this encyclopedia address not only basic subjects covered in the study of American government—from the Bill of Rights through voting processes—but a wide range of contemporary issues as well, such as abortion, capital punishment, and Social Security. Michael A. Genovese received a Ph.D. in political science from the University of Southern California and currently teaches at Loyola Marymount University. An expert on presidential studies, he is the author of Facts On File's Encyclopedia of the American Presidency, Revised Edition. Lori Cox Han received a Ph.D. in political science from the University of Southern California and currently teaches at Chapman University. She is the author of several publications, including Facts On File's four-volume Handbook to American Democracy, which she coauthored with Tomislav Han.